Check out Andrew Trice's post on AWX usage. Pretty cool ! , make sure that you set the output folder of the project to a web application folder. Remember, your api key is tied to a URL. 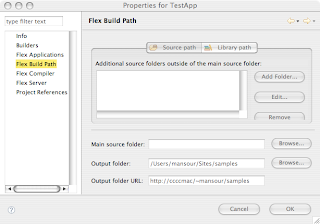 To get to this setting, use File -> Properties -> Flex Build Path. You can take advantage of AWS data sources, in this case Precipitation.US, to view dynamic data. As of today, the number of AWX2 beta users have reached a cool 883 ! Don't forget to place a crossdomain.xml file at the base of your ArcIMS host. Check out the Geography Network cross domain file as a sample. Following the previous post, here is an example on how you will be able to use in the upcoming beta3 the polyline mouse handler to create a distance measuring tool. So when I asked my friend Kerry (who BTW is the king when it comes to map projections) how to calculate the distance between two lat/lon points ? he pointed me to this link. He followed by saying "This is a good start, but what I have implemented in Java, takes care of all the 'weird' conditions!". This is why he is the king :-). So you can find the AS3 implementation here. And here is a simple MXML calculator. distLabel.text = dist.toFixed(2) + " meter(s)"
Following the last post, AWX can connect directly to a resource such as ArcIMS or even ArcGIS to get maps. The best way that I found out to see what crossdomain.xml the player is requesting, is to run the application in Firefox and watch the HTTP traffic using LiveHTTPHeaders. If you cannot create that file on that host, then use/create a proxy with a crossdomain file. Wait for the framework start event to lookup services registered by the activator.